Following American States Water’s (AWR) Q2 report, we are tweaking our 2015 estimated and 2016 estimated earnings per share (EPS) to/from $1.47/$1.45 and $1.53/$1.52, respectively, solely due to modified share repurchase timing. We still forecast roughly $80 million in total repurchases over the 2015-2019 period. We continue to believe a four-year EPS compounded adjusted growth rate (CAGR) of 5% off our 2015 estimate of $1.47 is achievable. AWR’s attractive fundamentals include a 5-year rate base CAGR of 5-6% supported by $90 million of annual capital expenditure, a 5%-plus dividend/share CAGR and a solid cash flow profile that includes the recent initiation of a second share buyback program (up to 1.2 million shares through June 2017, after completing the 1.25 million share program in May 2015). California update: All of Golden State Water Company’s (GSWC) service areas are meeting the mandated water usage reductions. Sales were 13% lower in Q2’15 versus Q2’14, and the trend is expected to continue in 2H’15. However, GSWC’s earnings have not been impacted, as California’s water revenue adjustment mechanism (WRAM, which decouples sales from revenues) provides financial protection. We believe more buybacks and/or a dividend-payout ratio increase may be pursued over the next five years, if an attractive investment and/or merger and acquisition opportunity does not arise, as AWR looks to maintain a consolidated equity ratio near GSWC’s authorized 55% level. Our 5% dividend CAGR results in a reasonable 62% payout ratio on consolidated EPS in 2019. American States Utility Services’ awards: While the request for proposal, or RFP, process is long (three-plus years), and the rate at which new bases have been awarded has been sporadic at best lately, we did gather a sense of optimism from AWR management recently that the military may announce a few RFP winners before year-end. In addition, the government typically announces construction project budgets at the end of Q3 — last time around ASUS was awarded $27 million worth. Stay tuned. Our $35-$36/share valuation range is based on a P/E multiple (apply an approximate 19 times multiple to our ‘17 estimate of $1.58) and dividend-discount model analyses. Regulatory and ASUS construction levels are key risks. We regard AWR as a low-risk water utility with a growing dividend. We consider California regulation to be constructive. We believe ASUS could contribute 15-20% to consolidated EPS, with upside potential if new military contracts are awarded. Our rating reflects valuation considerations. American States Water of San Dimas, California, is the parent company for Golden States Water Company (GSWC) and American States Utilities Services (ASUS). GSWC is a regulated water utility serving 256,000 customers throughout Northern, Coastal and Southern California, as well as providing electric distribution to 23,000 customers in Big Bear, California. ASUS provides non-regulated water/wastewater and construction services to nine military bases across the nation. AWR is a high-quality utility with a strong balance sheet (59% common equity) and high credit ratings (S&P A+). On Aug. 4, AWR reported second quarter 2015 earnings of $0.41 per share compared with $0.39 per share for the same period last year. Results by segment are outlined below. GSWC earned $0.33 per share compared with $0.33 per share last year. The positive impact of rate increases, lower interest expense and a lower effective income tax rate was offset by higher administrative and general expenses related to higher legal and other service costs [tied] to condemnation and drought activities. We continue to be impressed with the ASUS’ success and profitability and believe its experience and expertise result in the “non-regulated” business carrying the same risk-profile as the regulated water utility business, but with significant growth potential. Aqua America (WTR) reported Q2’15 EPS of $0.32 versus $0.31 in Q2’14. Results met consensus and missed our target by a penny. In our estimation, core operations drove most of the year-over-year upside. Revenue grew 5.4% to $205.8 million in Q2, bettering consensus for $205.0 million by a slight margin. Rate awards and customer growth (including acquisitions) boosted the utility. Topline growth in the quarter was WTR’s best figure since Q1’13. Operations and maintenance (O&M) expense grew 13.3% in Q2, a substantial surprise versus our model. Layered in costs from acquisitions remained a driver of O&M growth, and non-recurrence of a positive accrual hurt year over year. Executive transition costs added approximately 250 basis points to growth as well. Aqua announced a 7.9% dividend increase. The raise (to $0.178 per share per quarter) slightly undershot our expectation ($0.18 per share per quarter), but WTR remains one of the stronger divided- growth stories in the space, in our opinion. Maintain Buy rating: Aqua announced Q2 results that were solid but about as expected. That said, with the Q2 report being the first under the direction of new CEO Chris Franklin, most prominent to us this quarter was Mr. Franklin’s high level of transparency. We find this openness meaningful for a number of reasons. First, the visibility increases our conviction on WTR and supports our thesis. Second, the clarity should aid in removing investor uncertainty regarding the future of WTR under new leadership. There has been investment community concern surrounding this issue since the former CEO, who is considered by many in the investment community to be an industry innovator and leader, retired from his multi-decade CEO tenure this summer. We increase our 2015 EPS forecast by $0.01 to $1.26 and reiterate our Buy rating and 2015 year-end price target of $30. On the (Q2 earnings) call, Aqua provided 2015 diluted EPS guidance of $1.25 to $1.27. Also on the call, management stated the company is on pace to close 15 to 20 acquisitions by year-end, that when coupled with organic growth, is expected to contribute 1.5% to 2.0% of year-over-year customer growth. If this plays out, it will represent WTR’s highest growth rate since 2008. In our view, the company’s Q2 report validates our bullish call for WTR to grow faster than industry peers through 2018. From our perspective, shares of WTR remain a top long-term water industry investment. We are particularly encouraged by management’s comment on [a recent] conference call regarding a Pennsylvania filing update, which Aqua sees unfolding in 2016. This has been our call since we initiated coverage of the stock in Q3’13, and to us, the remark corroborates our positive outlook for the company. On Aug. 4, 2015, WTR reported second quarter earnings of $0.32 per share compared to $0.31 per share last year. Higher results were driven by acquisitions, rate awards, growth in the non-regulated business and a focus on managing expenses. Year to date, WTR completed eight acquisitions in Illinois, Pennsylvania, New Jersey, Virginia and North Carolina, increasing the customer base by 8,700 customers (0.9% growth). The acquisition of North Maine Utilities (NMU) in Illinois for $22 million represents the group’s largest municipal acquisition in 16 years. NMU serves more than 44,000 people through 4,700 metered-water connections and 2,500 wastewater connections. 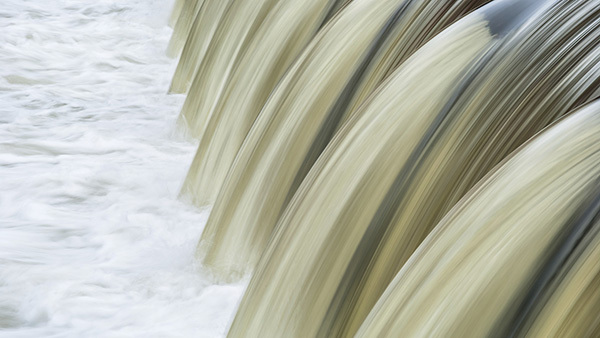 Management appears optimistic about its potential acquisition pipeline and targets water and wastewater systems with 5,000-15,000 customers. WTR expects to complete between 15-20 acquisitions in 2015, resulting in customer growth of 1.5-2.0% for the year. Management’s cost-centric culture is highlighted by the industry leading 34.2% operating efficiency ratio (operations and maintenance as a percent of operating revenues). Earnings growth will continue to be driven by rate increases, acquisitions, cost controls, infrastructure surcharges, the pipeline rehabilitation business and a recovery in the Marcellus water wholesale business. On June 3, 2015 WTR announced the appointment of Chris Franklin as CEO. Mr. Franklin succeeded Nick DeBenedictis (68), effective July 1, 2015. DeBenedictis will serve a senior advisory role for up to three months and will remain the non-executive chairman of the board. We believe the appointment favorably resolves any concerns regarding a succession plan, given Mr. DeBenedictis’ strong leadership role and identity with the company. While Mr. DeBenedictis is largely responsible for WTR’s impressive growth track record and financial success, we believe his extraordinary work ethic, cost discipline and shareholder-value driven philosophy have been infused throughout the organization. As such, we expect WTR’s strong growth to continue. WTR is a well-managed, low-risk, high quality conservative utility with unique growth opportunities.